Nonsense-mediated mRNA decay (NMD) is a eukaryotic mRNA degradation pathway involved in surveillance and post-transcriptional regulation, and executed by the concerted action of several trans-acting factors. The SMG1 kinase is an essential NMD factor in metazoans and is associated with two recently identified and yet poorly characterized proteins, SMG8 and SMG9. We determined the 2.5 Å resolution crystal structure of a SMG8-SMG9 core complex from C. elegans We found that SMG8-SMG9 is a G-domain heterodimer with architectural similarities to the dynamin-like family of GTPases such as Atlastin and GBP1. The SMG8-SMG9 heterodimer forms in the absence of nucleotides, with interactions conserved from worms to humans. Nucleotide binding occurs at the G domain of SMG9 but not of SMG8. Fitting the GDP-bound SMG8-SMG9 structure in EM densities of the human SMG1-SMG8-SMG9 complex raises the possibility that the nucleotide site of SMG9 faces SMG1 and could impact the kinase conformation and/or regulation. Nat Cell Biol, 2017, [Epub ahead of print]. The adult organism is characterized by remarkable plasticity, which enables efficient regeneration and restoration of homeostasis after damage. When aberrantly activated, this plasticity contributes to tumour initiation and progression. Here we review recent advances in this field with a focus on cell fate changes and the epithelial-mesenchymal transition-two distinct, yet closely related, forms of plasticity with fundamental roles in homeostasis and cancer. Proteins are often considered as molecular machines. To understand how they work, it is not enough to visualize the involved proteins under the microscope. Wherever machines are at work mechanical forces occur, which in turn influence biological processes. These extremely small intracellular forces can be measured with the help of molecular force sensors. Now researchers at the Max Planck Institute of Biochemistry in Martinsried have developed molecular probes that can measure forces across multiple proteins with high resolution in cells. The results of their work were published in the journal Nature Methods. When proteins pull on each other, forces in the piconewton range are generated. Cells can detect such mechanical information and modulate their response depending on the nature of the signal. 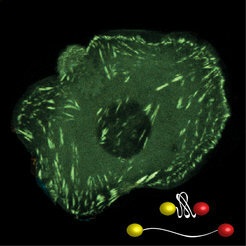 Adhesion proteins on the surface of cells, for instance, recognize how rigid their environment is to adjust the protein composition of the cell accordingly. To measure such tiny forces, the group of Molecular Mechanotransduction at the Max Planck Institute is developing molecular force sensors. “These small measuring instruments work along the lines of a spring scale,” says Carsten Grashoff, head of the research group. The innovative probes consist of two fluorescent molecules that are connected by a sort of molecular spring. When a force of just a few piconewton acts on the molecule, the spring stretches, and this change can be detected using a special microscopic method. “We’re now able to measure the mechanics of several molecules simultaneously,” Carsten Grashoff explains. In contrast to previous experiments, the scientists are not only able to determine which proteins, but also how many of them are under force at any given moment. A cell cycle-independent mode of the Rad9-Dpb11 interaction is induced by DNA damage. Budding yeast Rad9, like its orthologs, controls two aspects of the cellular response to DNA double strand breaks (DSBs) - signalling of the DNA damage checkpoint and DNA end resection. Rad9 binds to damaged chromatin via modified nucleosomes independently of the cell cycle phase. Additionally, Rad9 engages in a cell cycle-regulated interaction with Dpb11 and the 9-1-1 clamp, generating a second pathway that recruits Rad9 to DNA damage sites. Binding to Dpb11 depends on specific S/TP phosphorylation sites of Rad9, which are modified by cyclin-dependent kinase (CDK). Here, we show that these sites additionally become phosphorylated upon DNA damage. We define the requirements for DNA damage-induced S/TP phosphorylation of Rad9 and show that it is independent of the cell cycle or CDK activity but requires prior recruitment of Rad9 to damaged chromatin, indicating that it is catalysed by a chromatin-bound kinase. The checkpoint kinases Mec1 and Tel1 are required for Rad9 S/TP phosphorylation, but their influence is likely indirect and involves phosphorylation of Rad9 at S/TQ sites. Notably, DNA damage-induced S/TP phosphorylation triggers Dpb11 binding to Rad9, but the DNA damage-induced Rad9-Dpb11 interaction is dispensable for recruitment to DNA damage sites, indicating that the Rad9-Dpb11 interaction functions beyond Rad9 recruitment. Nature, 2017, [Epub ahead of print]. Cytosolic DNA arising from intracellular pathogens triggers a powerful innate immune response. It is sensed by cyclic GMP-AMP synthase (cGAS), which elicits the production of type I interferons by generating the second messenger 2'3'-cyclic-GMP-AMP (cGAMP). Endogenous nuclear or mitochondrial DNA can also be sensed by cGAS under certain conditions, resulting in sterile inflammation. The cGAS dimer binds two DNA ligands shorter than 20 base pairs side-by-side, but 20-base-pair DNA fails to activate cGAS in vivo and is a poor activator in vitro. Here we show that cGAS is activated in a strongly DNA length-dependent manner both in vitro and in human cells. We also show that cGAS dimers form ladder-like networks with DNA, leading to cooperative sensing of DNA length: assembly of the pioneering cGAS dimer between two DNA molecules is ineffective; but, once formed, it prearranges the flanking DNA to promote binding of subsequent cGAS dimers. Remarkably, bacterial and mitochondrial nucleoid proteins HU and mitochondrial transcription factor A (TFAM), as well as high-mobility group box 1 protein (HMGB1), can strongly stimulate long DNA sensing by cGAS. U-turns and bends in DNA induced by these proteins pre-structure DNA to nucleate cGAS dimers. Our results suggest a nucleation-cooperativity-based mechanism for sensitive detection of mitochondrial DNA and pathogen genomes, and identify HMGB/TFAM proteins as DNA-structuring host factors. They provide an explanation for the peculiar cGAS dimer structure and suggest that cGAS preferentially binds incomplete nucleoid-like structures or bent DNA. Sahasrabudhe P, Rohrberg J, Biebl MM, Rutz DA, Buchner J.
Mol Cell, 2017, [Epub ahead of print]. n autoimmune diseases such as multiple sclerosis, errant immune cells attack the body's own cells in the brain and spinal cord. Attacks triggered by autoimmune T-cells damage the nerve cells and result in the destruction of the sheath that surrounds these cells. The cells die off, with the result that nerve impulses are no longer transmitted correctly. A common feature of neurodegenerative diseases such as Alzheimer’s, Parkinson’s, and Huntington’s is the accumulation of toxic protein deposits in the nerve cells of patients. Once these aggregates appear, they begin to proliferate like weeds. If and how these deposits damage nerve cells and lead to their demise remains largely unexplained. A detailed insight into the three-dimensional structure of the protein aggregates should help researchers to solve this puzzle. Now, using cryo-electron tomography, scientists at the Max Planck Institute of Biochemistry in Martinsried near Munich have succeeded in generating a high-resolution, three-dimensional model of the huntingtin aggregates responsible for Huntington’s disease. The results are published in the journal Cell. Rampant weed growth – the nightmare of every hobby gardener. Trimming, cropping, cutting. Thorough garden maintenance is required. If this maintenance is neglected, weeds gain the upper hand and suppress the growth of crop and ornamental plants. The same applies to proteins in our bodies: molecular machines, large protein complexes that control vital cellular processes, assume the responsibility of a gardener. These molecular machines ensure that proteins reach their correct conformations and tend to and care for them for the duration of their lifespans. In order to carry out its function, a protein needs to adopt its correct three-dimensional structure. The building blocks of proteins, the amino acids, are assembled into long chains and folded into a complex form. If the resulting structure is faulty, the defective proteins are broken down in a strictly regulated process. If this does not occur properly, the misfolded proteins may aggregate forming clumps and deposits. Insoluble protein aggregates are toxic for cells. In the brain of patients suffering from neurodegenerative diseases such as Alzheimer’s, Parkinson’s, or Huntington’s, protein aggregates are often found. If and how exactly these aggregates exert their toxic effects has not yet been explained. This is the question studied by the ToPAG (Toxic Protein AGgregation in neurodegeneration) consortium. 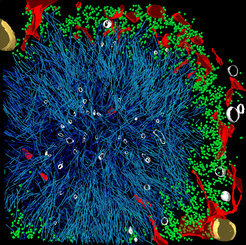 A team of researchers in the departments of Wolfgang Baumeister, Ulrich Hartl and Rüdiger Klein has succeeded in decoding a 3D structure of the protein aggregates linked to Huntington’s disease within their intact cellular environment. Wilhelm L. and Gruber S.
Methods Mol Biol. (2017), 1624, 117-126. A Chromosome Co-Entrapment Assay to Study Topological Protein-DNA Interactions. Chromosome organization, DNA replication, and transcription are only some of the processes relying on dynamic and highly regulated protein-DNA interactions. Here, we describe a biochemical assay to study the molecular details of associations between ring-shaped protein complexes and chromosomes in the context of living cells. Any protein complex embracing chromosomal DNA can be enriched by this method, allowing for the underlying loading mechanisms to be investigated. Providing the body with food is essential for survival. But even when full, we can still take pleasure in eating. Researchers at the Max Planck Institute of Neurobiology in Martinsried and the Friedrich Miescher Institute in Basel have characterized a type of neuron in the amygdala of the mouse brain that is involved in making eating rewarding. When given the choice, mice choose to activate these amygdala neurons. Artificially activating these neurons increases food intake even when the mice are not hungry. The neurobiologists have identified the neuronal circuitry underlying this behavior, raising the possibility that there could be cells with a similar function in the human brain. Specializing in behavior, electrophysiology and anatomy, the three doctoral students were able to provide insight into HTR2a cell function from a range of angles. “It was a very collaborative project,” recalls Amelia Douglass, one of the three lead authors of the study, which was published in Nature Neuroscience. “We frequently sat down together, went through the results and then built on them, applying new cutting-edge methods in the process.” Using this approach, the young researchers gradually discovered the role of the previously unstudied HTR2a amygdala cells and identified the neural circuitry involved. “Basically we showed that HTR2a cells have a positive effect on food consumption in mice, and that the mice like it when these cells are active,” says Douglass.